CAN YOU IMAGINE…. BEING SURROUNDED ON EVERY SIDE AS ISRAEL IS? Notice this map does not include Turkey or Asian Islamic Nations…but, they are all one with Russia according to Ezekiel 38 & 39. As the most visible Arab-American critic of Yasser Arafat and the phony “Palestinian” agenda, I get a lot of hate mail. I’ve even received more than my share of death threats. Most of those who attack me – at least those who bother to get beyond the four-letter words and insults – say I just don’t understand or have sympathy for these poor Arabs who were displaced, chased out of their homes and turned into refugees by the Israelis. assignment in the Middle East that year for the Tribune. His name was Karl Marx. Yes, that Karl Marx. A travel guide to Palestine and Syria, published in 1906 by Karl Baedeker, illustrates the fact that, even when the Islamic Ottoman Empire ruled the region, the Muslim population in Jerusalem was minimal. The book estimates the total population of the city at 60,000, of whom 7,000 were Muslims, 13,000 were Christians and 40,000 were Jews. “The number of Jews has greatly risen in the last few decades, in spite of the fact that they are forbidden to immigrate or to possess landed property,” the book states. Even though the Jews were persecuted, still they came to Jerusalem and represented the overwhelming majority of the population as early as 1906. And even though Muslims today claim Jerusalem as the third holiest site in Islam, when the city was under Islamic rule, they had little interest in it. Winston Churchill observed in 1939: “So far from being persecuted, the Arabs have crowded into the country and multiplied till their population has increased more than even all world Jewry could lift up the Jewish population.” Then came 1948 and the great partition. The United Nations proposed the creation of two states in the region – one Jewish, one Arab. The Jews accepted it gratefully. The Arabs rejected it with a vengeance and declared war. Arab leaders urged Arabs to leave the area so they would not be caught in the crossfire. They could return to their homes, they were told, after Israel was crushed and the Jews destroyed. It didn’t work out that way. By most counts, several hundred thousand Arabs were displaced by this war – not by Israeli aggression, not by some Jewish real-estate grab, not by Israeli expansionism. In fact, there are many historical records showing the Jews urged the Arabs to stay and live with them in peace. But, tragically, they chose to leave. Fifty-four years later, the sons and daughters and grandsons and granddaughters of those refugees are all-too-often still living in refugee camps – not because of Israeli intransigence, but because they are misused as a political tool of the Arab powers. Those poor unfortunates could be settled in a week by the rich Arab oil states that control 99.9 percent of the Middle East landmass, but they are kept as virtual prisoners, filled with misplaced hatred for Jews and armed as suicide martyrs by the Arab power brokers. After 1948, the land of Arabs who left the territory of Israelwas assigned to an administrator of absentee lands, and under Israelilaw the absentee Arabs could return and reclaim their land. Thousands ofthem did so (the figures I have seen are over 15,000). As to thoseabsentee Arab land owners who refused to deal with Israel, their landwas taken by eminent domain (called “compulsory purchase” in Britishlaw, or “expropriation” in European civil law), and they were paid fairmarket value plus interest. This is a story that for some reason has not received anypublicity, an act of informational neglect that from the point of viewof hasbara is positively criminal. This story should be told. Don’t take my word for any of this. Check it out with yourIsraeli sources. I believe that the Office of Administrator of AbsenteeProperty still exists in Israel. Please check it out. There is a warning for us all to heed. It is the Living God of us all who has restored the Jews to their homeland after thousands of years of bullying and thievery and any who touch them or their land shall be broken by His Hand, by His stone. 6 Up! Away! Flee from the land of the north, says the Lord. For I have spread you abroad as the four winds of the heavens, says the Lord. 7 Up, escape to Zion, you who live in Babylon. Whoever touches you touches the apple of my eye. 9 I will raise my hand against them. They will be plunder for their own slaves; and you will know that the Lord of hosts has sent me. I will live among you, says the Lord. and will be his people, and he will live among you. You will know that the Lord of hosts has sent me to you. 12 The Lord will inherit Judah as his portion in the holy land. He will again choose Jerusalem. because he is coming from his holy dwelling. FOUR BLOOD MOONS AND SUNS ECLIPSE 2014/2015. There will be four blood moons, one total eclipse of the sun, darkening the sun completely and one partial eclipse of the sun in 2014/2015 and each of them will fall on Jewish Feast Days and these will be the last for this century. All of this is according to the Jewish Lunar Calendar and Nasa’s Lunar calendar, but, not according to our Gregorian calendar. We would all miss these facts if they were not revealed to us by Mark Biltz of Shaddai Ministries. These events are no small thing considering what has occurred in Israels past when Blood moons have landed on Jewish Feast Days. 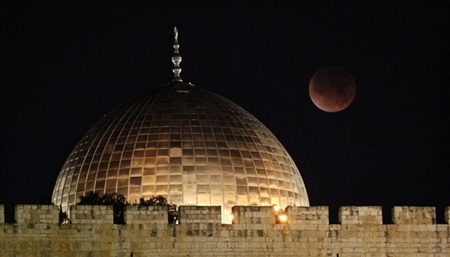 It cannot be regarded as coincidence that all four blood moons of 2014/15 occur on religious festivals of Israel, together with two eclipses of the sun also on important days in 2015. A blood moon will occur on the 14th day of Nisan in 2014, when the Passover will be celebrated in Israel (Leviticus 23:5). Nisan is the first month in Israel’s religious calendar. On the 15th day of the seventh month (Tishri) when the Feast of Tabernacles begins (Leviticus 23:34) there will be another blood moon. Exactly the same pattern will be repeated in 2015. Because of Israel’s lunar calendar these dates all coincide with the full moon – on these occasions the moon will become blood-red. Apart from the lunar eclipses there will also be two eclipses of the sun in 2015… on the first day of Nisan and again on the first day of Tishri. The Rosh Hashanah (Jewish New Year) is celebrated on 1st Tishri, which is the beginning of their civil calendar. 2013 through 2014 will provide the leading events in the next 2014 – 2015 blood moons (tetrads) that are predicted to occur The eclipses of the sun and moon confront us with precise dates which cannot be manipulated…! Nevertheless, these signs should not be seen as an attempt to date-setting for the Second Coming of Christ but rather as a wake-up call to be ready for what may happen in the near future. Now is not the time to lapse into spiritual slumber like the Matthew 25 foolish virgins. 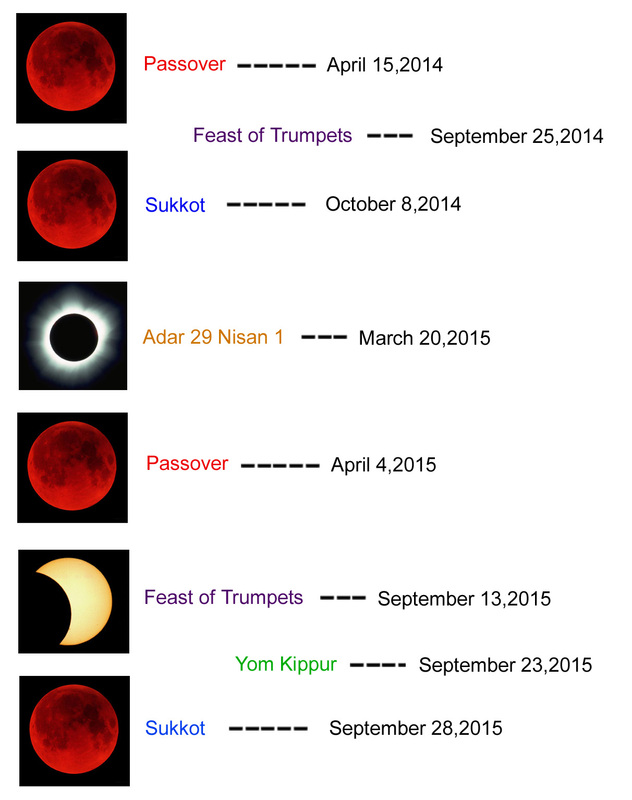 There will be a string of four “blood moons” in the year 5775, and one of them will shine over the Passover seder. Whenever this happened in the past, enormous events took place in Jewish history. The verse about the sun turning dark and the moon turning to blood, is at the center of a new, hot, Christian bestseller titled “Four Blood Moons,” by Pastor John Hagee. It is based on a discovery by Pastor Mark Biltz, who runs a “Hebrew roots” ministry in Tacoma, Washington: Red Moons. Biltz’s website declares: “We do not want to convert Jews to Christianity or Christians to Judaism,”. He based his observation on the verse in Genesis 1:14: “And God said, Let there be lights in the heaven to divide the day from the night; and let them be for signs, and for seasons, and for days, and years.” God originally plans to use the heavenly lights as signs, and the prophet Joel foretells that a blood moon would mark the day of the Lord – then it stands to reason that dramatic things should be taking place when a blood moon is up in the sky. The science of the “blood moon” phenomenon is fairly simple. It is created by a partial lunar eclipse. When the Earth’s shadow covers the moon completely, we get a total eclipse. A partial lunar eclipse happens when the Earth’s shadow covers the moon only partially. The earth atmosphere bends light around its edge, and scatters out shorter-wavelength light (green through violet), leaving longer-wavelength light (red, orange, and yellow) in the Earth’s shadow. This is also why sunsets and sunrises generally appear red. As is the case with most miraculous events that can be explained scientifically, the miracle is not in the natural phenomenon, but rather in its timing. So the Book of Joel describes solar eclipse, followed by a partial lunar eclipse, as precursors of the Day of the Lord. The prophecy in Joel, like most prophecies, is surreal, beautiful, and open to many interpretations. But we can take away from it the notion of a blood moon as a sign, and check out the calendar for the next bunch of partial lunar eclipses. Pastor Biltz looked at NASA’s tables for solar and lunar eclipses and found a string of lunar and solar eclipses happening in 2014 and 2015 and then nothing like it for the rest of the 21st century. In 2015 there will be two solar and lunar eclipses two weeks apart (on the new moon and full moon) one in the spring and one in the fall. This will produce four blood moon eclipses in a row. This is amazing because they all fall on Jewish Feast days.